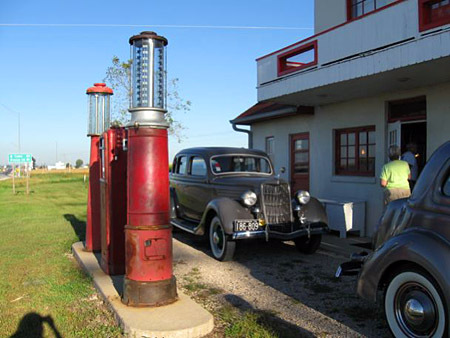 The 2nd Annual Iowa Lincoln Highway Motor Tour will cross the midwestern state on August 28–30. The Friday-to-Sunday trip begins in the west at Desoto Bend and heads eastward with stops in Carroll, Jefferson, Boone, Nevada, Marshalltown, Tama, Youngville, Cedar Rapids, Mechanicsville, Lowden, and ending at Clinton. Here are some photos from the 2008 tour by Bryan Osberg. ABOVE: Approaching the Union Pacific Bridge via old brick section of Lincoln Highway, just past Cornell College in Mt. Vernon. 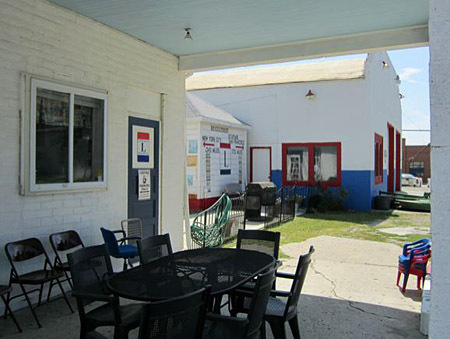 ABOVE: The first stop on the second day was Youngville Cafe. ABOVE: Lunch day 3 at the Brickstreet Station in Woodbine. Visit the Iowa LHA page for a full itinerary and more info.